Prospecting in football, at least when it comes to cards, is a lot different than baseball. In football, players traditionally go from college to the pros, leaving not a lot of lag time as players currently in college can't have items. 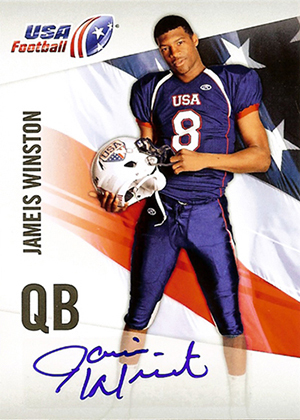 2012 Upper Deck USA Football is an exception. It brings a genuine prospecting element like few products can (Leaf US Army All-American also comes to mind). Because of it, the factory set has the first cards of Jameis Winston and Todd Gurley. 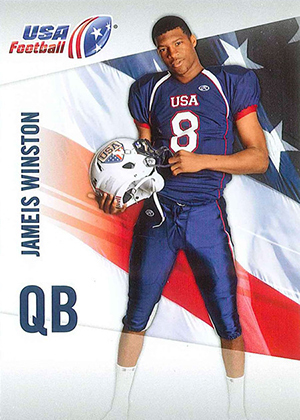 Celebrating the USA Football national team, the set captures players early. The premium box set has a complete 50-card base set that showcases 49 players. There's also a checklist. Sealed sets also come with eight hits: two autographs, a patch card and five game-used memorabilia cards. Autographs include base set parallels, Under-19 National Team Signatures, USA Football Future Watch Swatch Autos (#/5) and USA Football Future Watch Patch Autos (#/2). 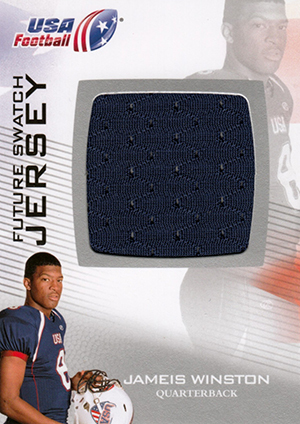 USA Football Future Watch Swatch basic game-used cards also have patch parallels. Other memorabilia cards are under the Under-19 National Team Future Swatch banner. Besides Winston and Gurley, other top prospects in the set include Kiehl Frazier, Joe Bergeron and Jaxson Shipley. 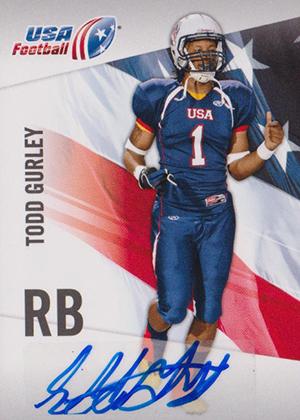 Todd Gurley 2012 Upper Deck USA football Rookie...very, Very Rare On Card Auto!